The worlds best-selling annual is back and crammed with thousands of amazing new records, cool facts and awesome pictures! Ever wondered how far a dog can ride a scooter or whos swallowed the most swords underwater? Want to know about the latest sporting achievements, extreme bodies and cutting-edge tech? 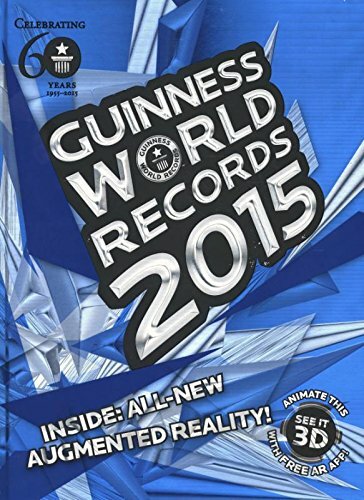 Find the answers to these and many more mind-boggling feats in the all-new Guinness World Records 2015. Read all about whats happened to your favourite records, plus discover never-before-seen record-breaking facts like who took the first selfie in space, how fast the worlds smartest computer can do the sums and even how many people twerking youd need to beat the current record (it currently stands at 358 if youre interested). 60th anniversary celebration Whats more, 2015 marks 60 years since the release of the very first GWR annual; its our diamond anniversary! To celebrate this achievement, youll find a special feature just on diamond records, as well as milestones of our classic records and how theyve changed - or not changed - over time. In the 1955 edition the most expensive bottle of wine would have set you back GBP8; but the current record-holding bottle of plonk sold for a staggering GBP75,000. However, not everythings changed in the past six decades - did you know that Robert Wadlow, who towered 2.72 m (8 ft 11.1 in) in 1940, still holds the record for tallest man? At least for now - GWR in another dimension! As if the book werent exciting enough, our See It 3D augmented reality app is back with new features that bring the book to life! Use your smart device to unlock interactive elements that literally jump off the page. See how you size up to Wadlow, meet deep-sea creatures up close, play our Splat-the-Maggot game and much more.